Ariata Quintet | Zonyxa. Unique and contemporary jewellery for Work. Love. Play. 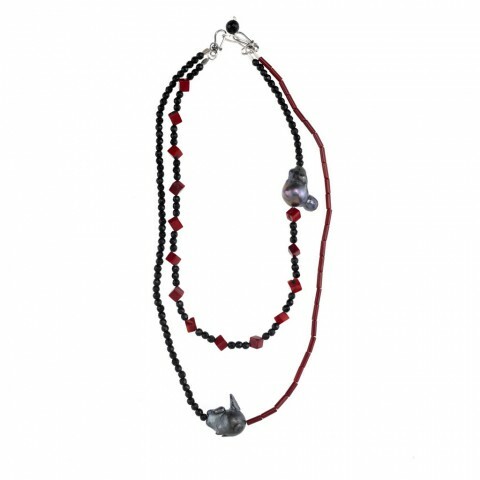 Presents a magnificent Freshwater baroque pearl flanked by red coral and black onyx creating a simple but a striking neck piece. This piece features a freshwater baroque pearl flanked by coral cubes and onyx beading. Designed to work with Ariata Grande as either a double strand or long necklace or it can be worn independently as an easily adjustable bracelet. Materials: Freshwater baroque pearl, onyx and coral quintet set. Price is for the two pieces.